The CPT analyses towns, cities and settlements down to street by street level, highlighting cycling potential through a visual map backed up by statistical outputs. The CPT also allows for deeper analysis by incorporating areas such as cycle network quality, health data, deprivation statistics, air quality measurements and other geocoded datasets. 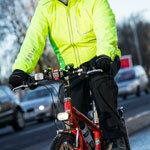 Carbon savings or health benefits from ‘realising’ cycling potential can also be calculated with the CPT.